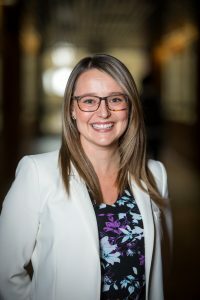 I am currently a Senior MBA Career Advisor at the University of Alberta, working with MBA students to develop the skills, network, and knowledge to pursue successful careers. I am also currently completing a PhD in Canadian literature through the University of Waterloo; my dissertation addresses popular reading practices in Canada and how Canadians articulate, discuss, and connect through these reading practices on Twitter. How did you end up in that career? It’s a complicated but fun story! My research and teaching work at the University of Waterloo were inspired by the support and education I received as an English student at CUE. My English professors set excellent examples of university teaching that I wanted to emulate, and also encouraged me to continue my research as an academic. After my Bachelor’s degree in English, I pursued a Master’s degree at Queen’s University, and then spent some time working in various roles, including a Professional Development Assistant for a professional association and a Writing Centre Coordinator, all while teaching undergraduate English courses. I eventually decided to pursue my PhD at the University of Waterloo, where I taught several undergraduate English and Writing courses, and did research specializing in Canadian popular reading culture and Twitter. While at Waterloo, I also became interested in providing professional development opportunities for graduate students, which resulted in a position as a Career Leader at the university’s Centre for Career Action. I worked one-on-one with undergraduate and graduate students to help them develop strong resumes, cover letters, and interview skills. This position sparked my interest in Career Advising, which led to my current position at the University of Alberta. It’s an exciting role that allows me to use the writing and coaching skills I’ve developed over years of teaching, while also connecting individually with students to help them achieve their goals. How did your English degree help you get where you are today? My English degree has been extremely important in helping me find success. The writing, literary analysis, and critical thinking skills I developed through my English degree are extremely useful when coaching students to develop strong career documents. Even more important, however, is my ability to ask thoughtful questions and communicate effectively with my coachees. I’m glad that my English degree didn’t direct me towards one, predetermined career path; instead, it equipped me with a number of incredibly useful skills transferrable to many contexts. I’m now lucky enough to be in a position to help students from many backgrounds understand that a variety of career options are possible if they can clearly articulate the many transferrable skills developed throughout their time in university.